In 2015, Friends of Nella Dan acquired the R/C ship model of MV Nella Dan. The model had last been seen at the Steam Festival in Vejle in 2006 – and for a long time we thought it had been lost. Now, Nella Dan is ready to get back on the water with a full crew. The R/C model of Nella Dan in Søren Sørensen’s model workshop (2015). Model maker Søren Sørensen, Vejle, worked on the model for close to six years. At one point, Søren reached an impasse concerning the details of the deck and the outfitting and had to put the work on hold for a year and a half. Søren jumped into his car immediately and drove straight to Esbjerg from Vejle, boarding Nella Dan in Esbjerg Harbour that same afternoon to measure deck gear, new lifeboats, davits etc. after the latest modifications that had been carried out in Newcastle that summer. 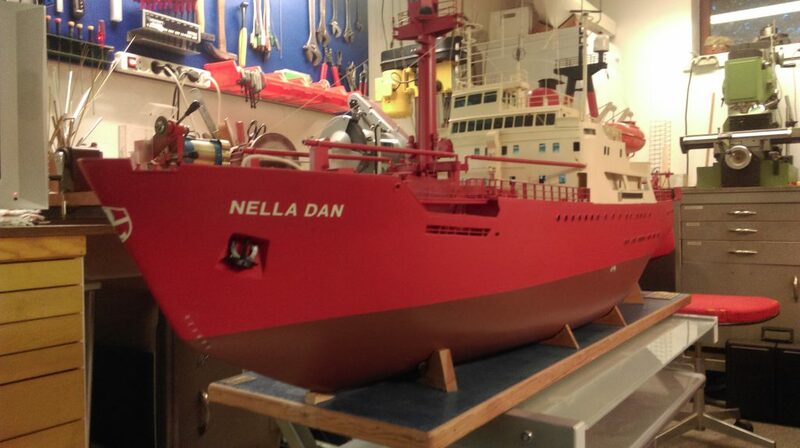 The model is thus the last and most detailed registration of Nella Dan, as she looked before her final southern voyage. This was Nella Dan’s first, only and last visit to her home port of Esbjerg. Søren Sørensen’s model measures some 150 cm and weighs 50 kg with ballast. It is remote-controlled and features both engine smoke and running lights. It has received awards in several model shows since 1993. The model is kept at KNUD E. HANSEN in the city of Elsinore north of Copenhagen.